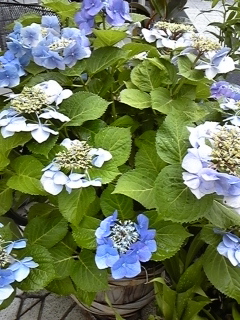 Rainy day season has come, but it is beautiful to see the hydrangea flower in the rain. Hydrangea is a genus of about 70 to 75 species of flowering plants native to southern and eastern Asia. By far the greatest species diversity is in eastern Asia, notably China, Japan, and Korea. Most are shrubs 1 to 3 meters tall. I found some of the flower near the HOSTEL 64 Osaka and One of my favorite kind is called Hydrangea macrophylla in scientific name. Some of the temple in Nara or Kamakura has beautiful garden with hydrangea or Lilly or iris. Worth while to visit those temples.